The Den Haan & Wagenmakers collection is mainly based on antique examples from the 17th and 18th centuries. 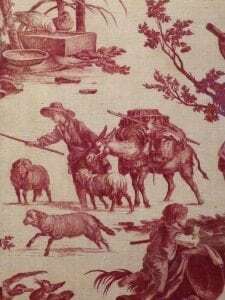 These cotton fabrics were brought to the Netherlands by the merchants of the Dutch East India Company (VOC) from the Dutch settlements on the Coromandel coast of India. The original native patterns were adapted to suit European fashion, taste and purchaser under the supervision of the VOC. 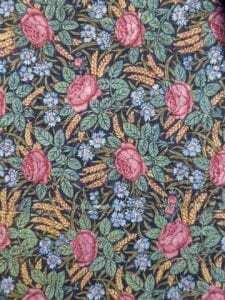 We know the end result as the cotton chintz which was used in particular in West European interiors and the clothing and costume of that period. Various parts of traditional Dutch costume were made in this chintz. A feature of the original cotton chintz is the low shine which was obtained by calendering using rice water and stone polishing. The characteristic sheen was applied to the cotton fabric not merely to given the appearance of the silken materials of the time, but of course also to resist dirt and moisture. 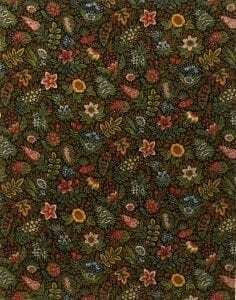 In the 18th century a new printing method was developed in West Europe which meant that the original chintzes could be reproduced, putting an end to imports from India. 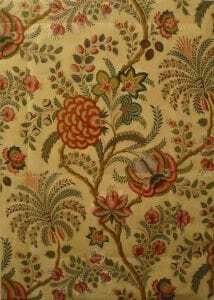 If you are wondering where the name chintz comes from, it is fairly readily explained by comparing it with the original Indian description for this sort of floral cotton material, “chitti”, meaning calico. 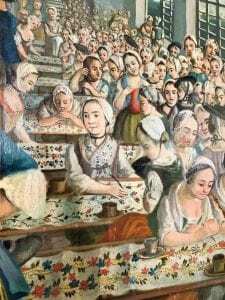 Increasing demand in Europe led to many fabric printers being set up; in Amsterdam alone in 1750 there were some 80 printers and polishers, but by 1816 only a single printer, ‘Overtooms Welvaren’ remained, to be sold and shut down the following year. During the 19th century production was taken over by more modern mechanised printers. Original flat printing table at Betina – Goor. The Netherlands in 1964. Today Betina BV printing is reproducing a number of these original hand painted and coloured floral designs as the Den Haan & Wagenmakers collection. Willem Rudolf den Haan is the creative figure responsible for the adaptations and drawings from the authentic chintz fabrics with floral patterns and palempores with trees of life, intended for interior applications and historical clothing, but particularly for patchwork and quilts. Since the ’90s the Den Haan & Wagenmakers collection has been printed by Hans ten Voorde, the owner of Betina BV printing in Goor, Netherlands. He is responsible for the hundreds of printing cylinders and the complete production process with recently also the exclusive sale to individual customers through this shop on line. Oil paint panel by A. Maury – France. Presentation of musicians and listeners dressed in aprons of typical European printed cotton fabrics. France ca. 1800. Various printed fabrics “Indiennes” and “Toile de Jouy” made in Europe. Alsace and Jouy en Josas. France late 18th century. Fragment of a border pattern printed and painted in chintz techniques. Fragment of a floral pattern printed and painted on cotton fabrics in chintz techniques. India about 1780. Different garments to European fashion worn in the second half of the 17th century consisting of skirts, jackets made of cotton fabrics printed and painted in chintz techniques. India ca.1750. “Japanese men’s skirt”, men’s dressing gown and a ladies costume both worn in Friesland in the middle of the 18th century, consisting of a skirt and a jacket with lace sun hat. “Japanese men’s skirt” and women’s skirt and jacket made of cotton fabrics printed and painted in chintz techniques. India about 1750. Dutch quilt made around 1860 in the province North Holland. Previously coll. DH&W, currently belonging to the Dutch Quilters Guild. Children of Island Marken’ with on the left costume for boys up to 6 years with skirt and apron “Druivenboezel/Grapeberry”, used as inspiration for our collection tone on tone’s. The girls wear a jacket and breast piece “baaf” or “bauw” of chintz fabrics with a checkered apron. The boy on the right image wears the antique amber necklace with a silver coin, used on Pentecost which is the most important day for traditional costumes on the Island of Marken.